Some Behemoth designs-in-progress, head only. Like Leviathan, Behemoth is kosher, so I infer he/she/it is a cloven-hooved cud-chewer. Some Behemoth designs-in-progress, head only. Like Leviathan, Behemoth is kosher, so I infer he/she/it is a cloven-hooved cud-chewer. #4 seems accurate. I don’t remember Behemoth having multiple faces (correct me if I’m wrong). But what the hey, it’s all open for interpretation! Give it wings and tentacles if ya like! The number of Behemoth’s faces isn’t specified, so I figure it can have many. But it can’t have wings, which is quite a limitation. Behemoth is the earth monster, the wings belong to Ziz. And because Behemoth is kosher, I think a lion’s face is inappropriate. Behemoth is a killer, not a carnivore. Ziz, however, traditionally has a lion’s head, so I’m saving that for him/her/it as well. I think I like #1 because it’s more symmetrical. 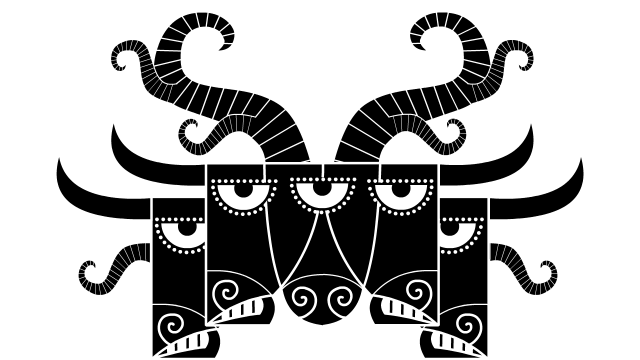 I like the doubled-horns in #2, but not so much the repeated eyes/faces — this kind of resonates with the aesthetic of Hindu mythological images. #4 is pretty good, but is, well, _square_. For #3, the asymmetry bothers me — that looks a little “Frankenstein”, a slapped-together monster. The question of the gender of these cosmically large creatures is a matter of debate in the midrash aggadah in the Talmud, the question being that if all creatures were created male and female how does that apply to these primordial beings. In Sefer Ḥanokh (1 Enoch) Leviatan and Behemot are each other’s mates. That source is very early — perhaps even circa 6th century BCE. 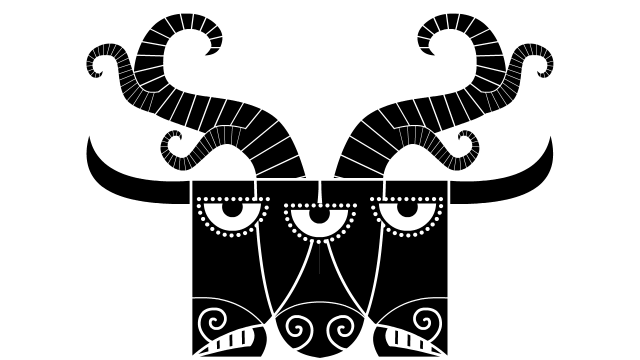 The midrashim have it that Behemot’s thighs are knitted together (implying some sort of androgyny). On the other hand, according to one midreash the male Leviatan was pickled and God reduced the sexual desire of the female (so she wouldn’t suffer) to prevent their mating and filling the entire creation with ginormous Leviatanim. I wouldn’t call the Ziz, Behemot, or Leviatan monsters. Nor would I consider them as meat eaters. They are primordial creatures personifying elemental/natural powers. In one mythical eschatology the Behemot and the Leviatan are made to combat one another gladiator style, and then after they kill each other, their bodies are consumed in a feast. The story is visceral but is understood with a deeper meaning. Predatory nature is the default in this age. At the end of this Age (Olam Hazeh), the cycle of predation is ended, so that the peace of the Next Age (Olam Haba) may come. The primordial creatures contain aspects of the primordial light preserved from the onset of creation. The “eating” of these creatures is a metaphor for the realization and revelation of divine awareness hidden (for some) in Nature. Also, I pick Behemoth No 4. I like the assymetry, but besides that — I’m not certain where the multiple eyes idea is manifesting from? Could you clarify your inspiration behind that feature? There is something about the crowd of faces that makes me feel ganged up on to look at it. It is immediately impressive and intimidating. Behemoth 3 is also really good and seems suitable for showing the creature in profile. Aargh, number 3 has grown on me, if only it had the tentacular horns! Incredible designs, whichever one is chosen. Oh, I change my mind to Behemot 1. 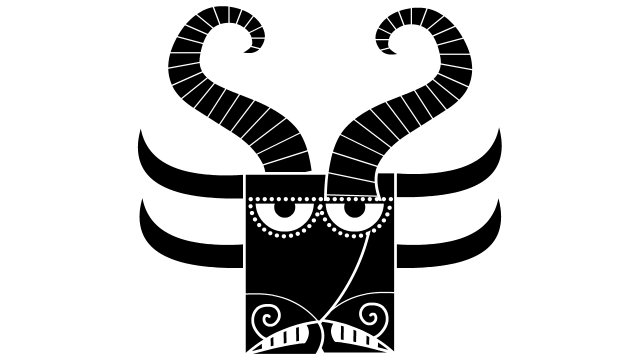 Tentacular horns indeed! I’m understanding the multiple eyes as an inspiration from cubism? I vote for the top image. Nice classic triple face. I prefer #2, but I’d almost want an excuse to start with #1 and then kick it up a notch when Behemoth needs to be more intimidating. I like Behemoth #4 the best. 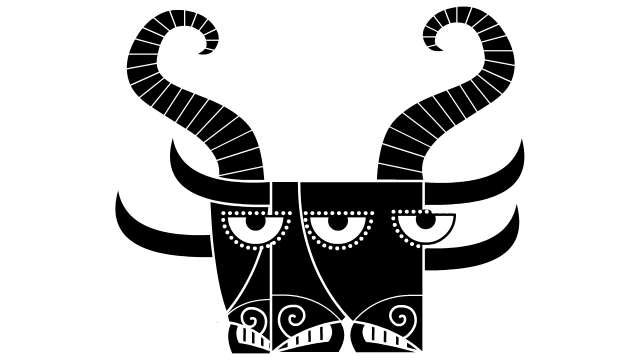 That being said, maybe he can expand his face (eye count, horn detail etc…) depending on his mood? I actually prefer the asymmetry of #3, which is odd (he said) because I tend to go for symmetry. But the asymmetry gives it an extra dynamic shove. Sort of the Blakean thing of the creature of dynamic energy. I also like the idea that B #3 can sweep his head from side to side as he stands, just by color-cycling the forms without altering anything else. The face colors would never be fixed. It might be cool to do the same thing with a tail. The face of #3 – so unique and a little unexpected! And the horns of #1/2 in both look and placement in relation to themselves and the face. #3. By far the most interesting. This is a very intriguing new project. But why can’t #3 have the horns of #1? They’re all wonderful, but the slightly-lower orientation of the center eye in Behemoth 1 gives it the edge. I prefer #2, but #3 freaks me out for some reason.